When we were in Medellín we originally had the idea to directly return to Bogotá. Until we studied the map. 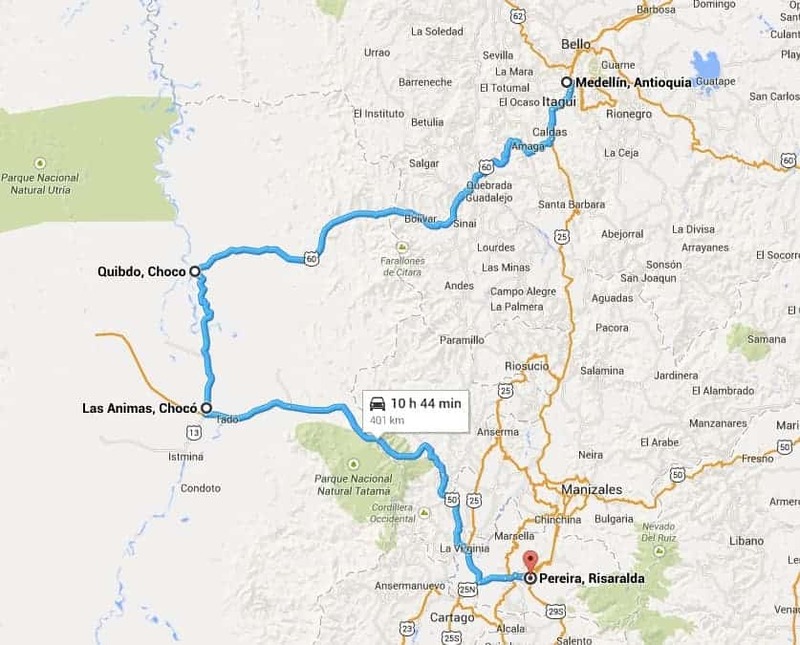 “Why not take this loop via Ciudad de Bolívar to Quibdó and then to Pereira,” Coen mused. Indeed. Why not? Maybe because the Chocó Region is still FARC territory? “I’ll ask around,” Coen suggested and so he did. First he checked with Rafa, the owner of the hostel we were staying (find it here), and who wants to move to the Chocó. “There is the guerrilla. If you’re afraid of them, don’t go. But the way you travel and the ease with which you meet strangers, I would go,” he said. 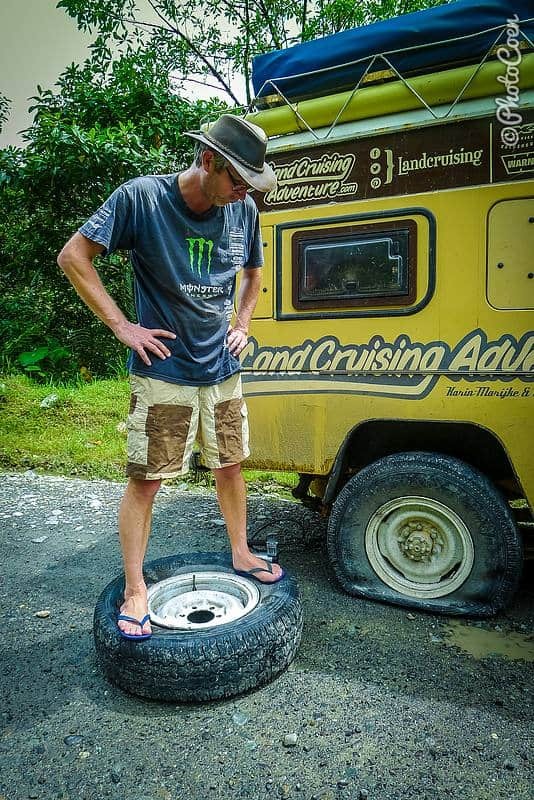 Then Coen asked for more opinions on Facebook, preferably (Colombian) off-roaders who might have driven that stretch. The answers were mixed and not inspiring. When Coen asked whether they had been there themselves, the answer was ‘no’. 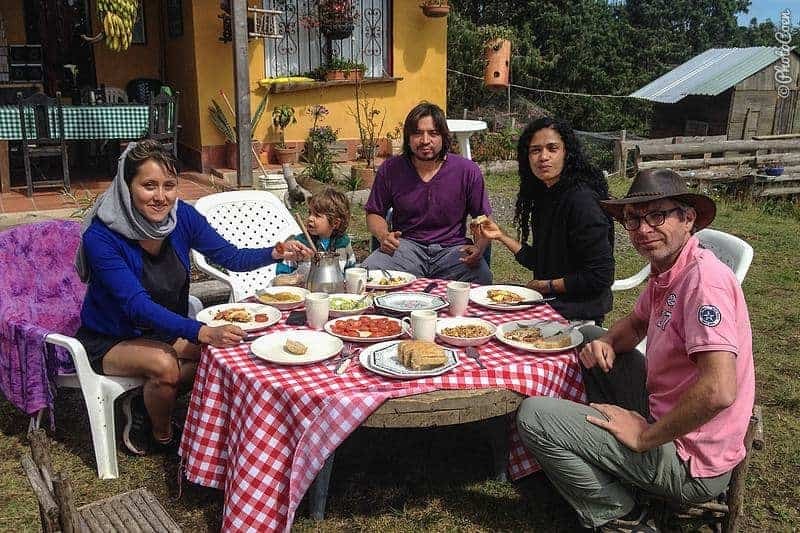 “Dear Coen, welcome to Colombia, and I hope you will have a nice staying here. The route you are looking forward to get done, you must take one day to go from Medellin to Quibdo, and another day to go from Quibdó to Pereira. The only advice I can provide it is not going at night, that will not be any problem during the Day Light. The distance from Medellin to Quibdó it is aprox 220 km, and more than have with no asphalt. You will take like 2 and a half hours from Medellin to Ciudad Bolivar, and aprox 10 kilometers after passing Bolivar, then the asphalt will end. There are trucks and buses going all over the off road, so if you have a 4×4 you do not need to pull over the 4wd. From Ciudad Bolivar to Quibdo you will take aprox 4 hours, you will find only two towns in between, the first is Carmen de Atrato, and then 15 km before Quibdo you will find the place Tutunenedo. In Quibdo there are hotels, should you need a good place for meals on the border of the river and if you have tent in top of the roof of your car Go to Brisas del Atrato Restaurant. The tipical dish it is Sancocho de Bravo it is delicious if you like fish. Now that was solid advice, which, most importantly, it sounded much more promising. 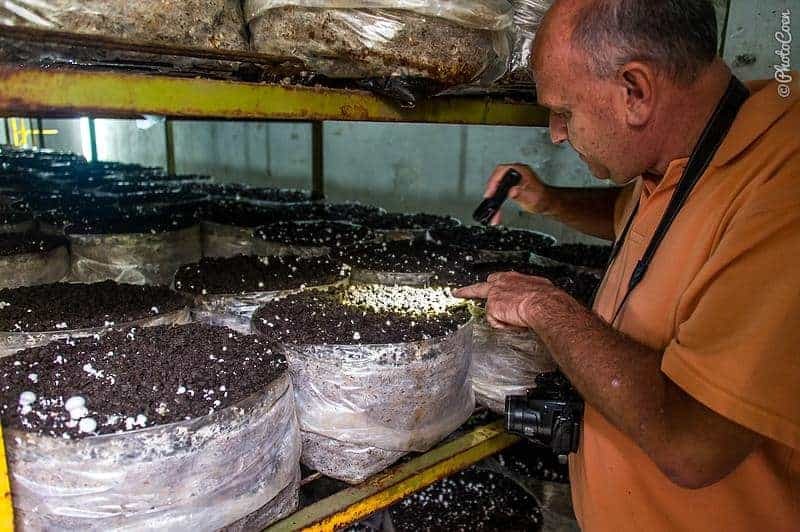 Previously we had stayed with Peter Wubbena, a Dutchman owning and running a commercial mushroom farm near Pereira. He likes exploring off-roads, so we asked his opinion. He wasn’t familiar with the route to Quibdó, but his friend Luis Jaime in Ciudad de Bolívar was, who owns fincas (farms) in that region. 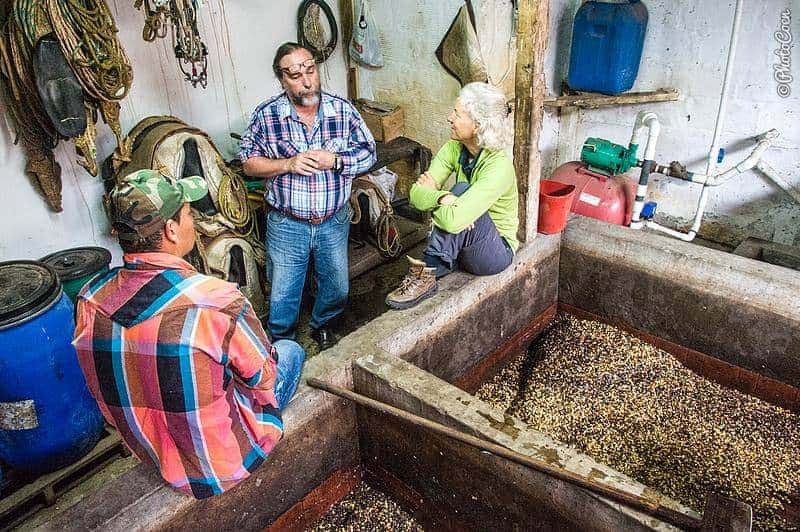 We drove to Ciudad de Bolívar, stayed at Luis Jaime’s place for two fantastic days during which he showed us around on his and other coffee farms. Luis Jaime saw no problem us going to Quibdó. We left Ciudad de Bolívar early morning and drove uphill, into the clouds and rain. Parts of the road were unpaved, parts were in the process of being surfaced. The road meandered up to Alto de la Sirana at 2,100 meters after which we descended in mist. 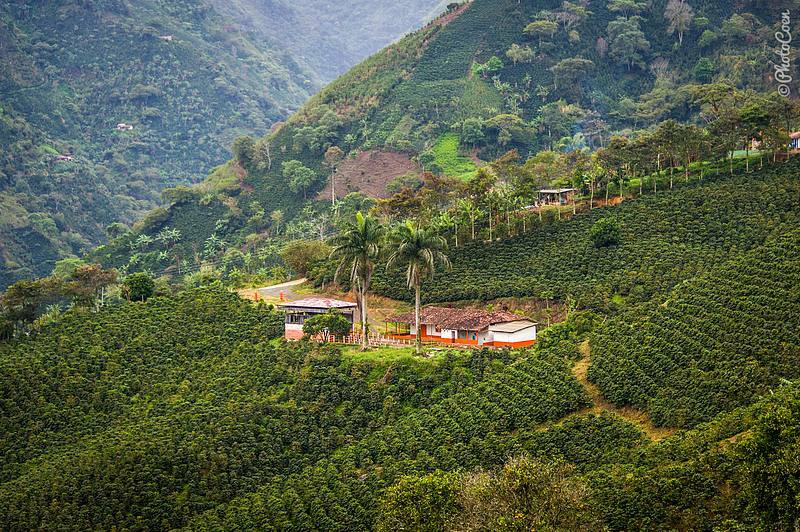 As the mist cleared we could see how the coffee plantations made way for cattle ranches and forests. La Siete (7) was the first village with a name that is nothing but a number. Later we would come across La Quince (15th) and La Veinte (20), but the numbers bear no relationship to the distance between the towns. It was Sunday, which in a coffee country such as Ciudad de Bolívar is an ordinary working day. In fact, since many coffee farmers pay their workers in the weekend, banks have to be open, as do all the shops. People from the countryside come to town to get paid, drink, and buy their groceries for the week. Work or not, the outdoor cafés are busy too, serving people endless cups of coffee or tragos – alcoholic drinks (shots). In La Siete this was no different. Music was blaring from the speakers, people were enjoying a drink in the local café colorfully painted in orange and green, with plastic chairs and traditional music blaring from a crackling radio. We enjoyed being here but the reason not to linger was a pouring rain. We drank our tinto in the car instead. The road deteriorated with lots of potholes. As we were descending into more tropical areas, the main crop became cana, sugarcane. 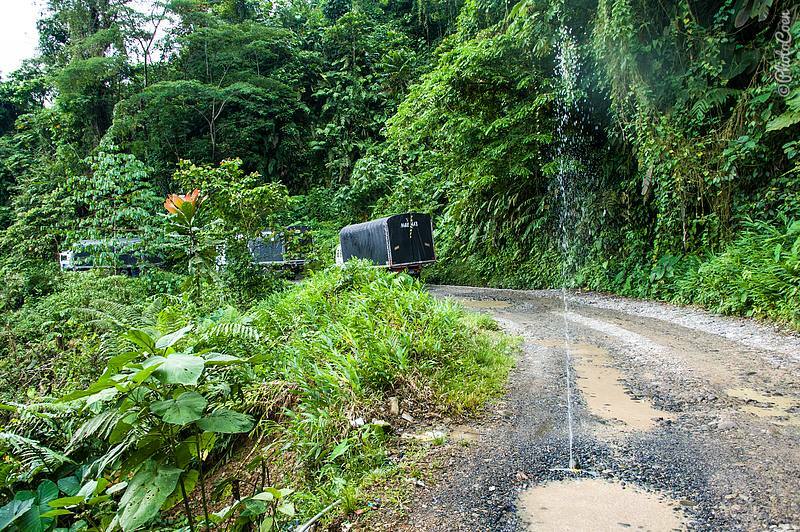 Being here was reminiscent of driving Bolivia’s Death Road (read about it here): a narrow, muddy or gravel road where trucks need to maneuver to overtake or pass each other, waterfalls tumble from the vertical, rocky walls onto the road, and landslides are common. We heard that trucks prefer driving at night on this stretch. They can see each other’s headlights in the distance, which makes it easier for them to calculate who will stop where so they can pass each other without one ending up in the ravine. 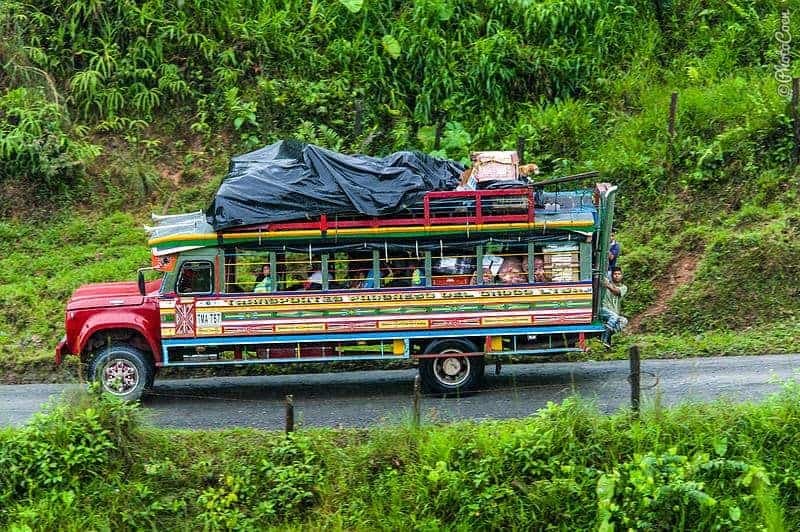 For a long time we couldn’t overtake a chiva – a local bus, typically painted in bright colored designs. Two young men hung from the back, holding onto the ladder to the roof rack. They turned around, studying us. Both had a long machete hanging from their belts. On the roof rack, among loads of luggage, sat a dog. 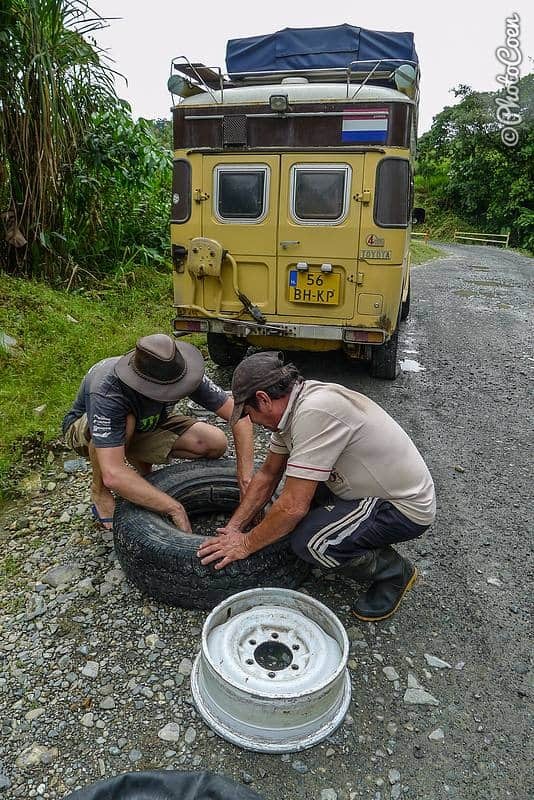 We stopped for a flat tire on the right front side. Coen changed it in an iffy, but only ten minutes later we had a second, this time on the right rear side. That was a first: two flat tires and no time in between to get the flat tire fixed at a workshop. And we carry only one spare. 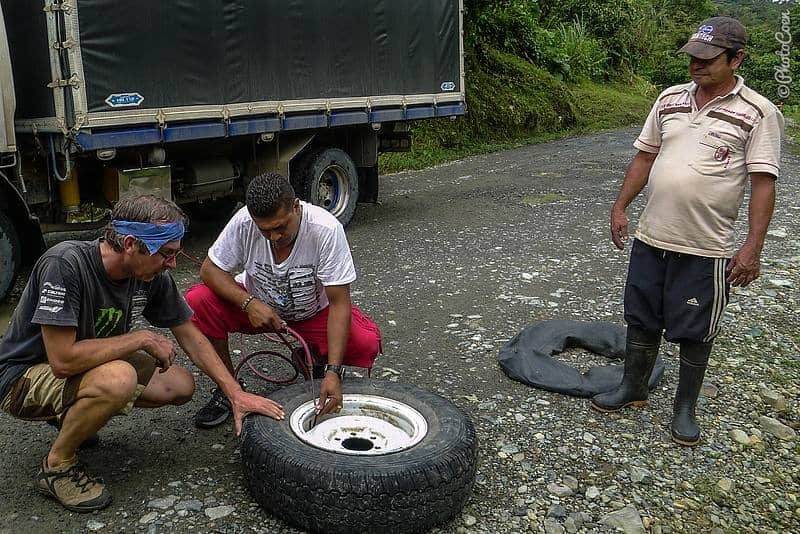 But since we were right in front of the village La Quinta, we figured we could get the tire fixed there. But no, in La Quinta is was Sunday indeed, and the car-tire workshop closed. 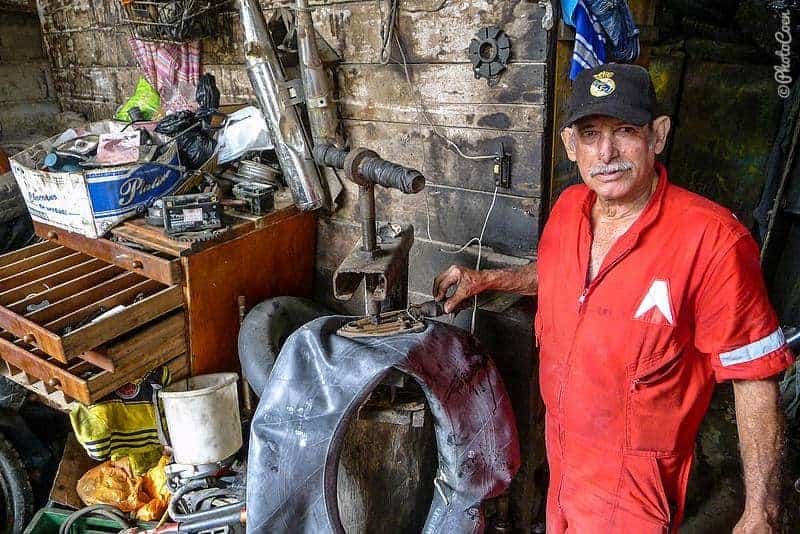 So now we had the option to fix the flat ourselves, or to hitchhike to La Veinta – 40 minutes from here, the locals said – but the chance of finding a workshop open there wasn’t evident. Fortunately, we were prepared. 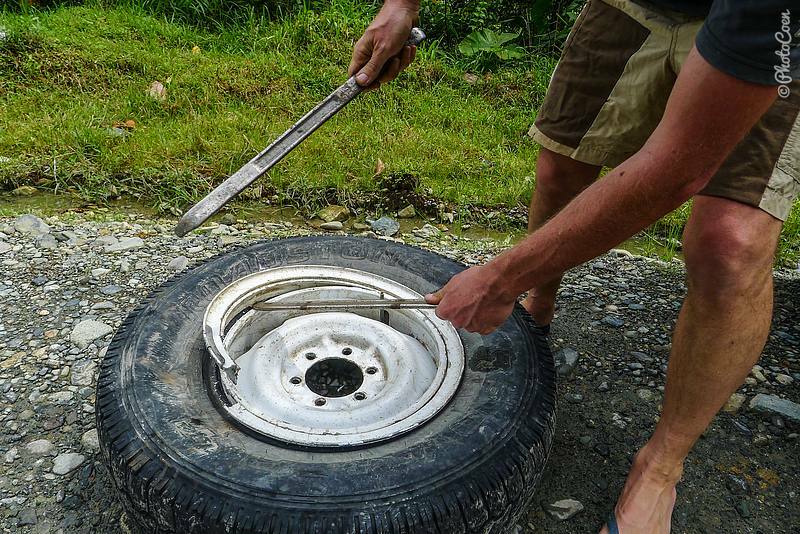 In Peru Coen had bought two tire irons so he would be able to change an inner tube himself (of which we do carry an additional spare). We got all the tools out and set to work. A man on a motorcycle stopped to ask if we needed help. A local man from the village walked up to us to give a helping hand. Coen was focused on changing the inner tube, which went rather well. 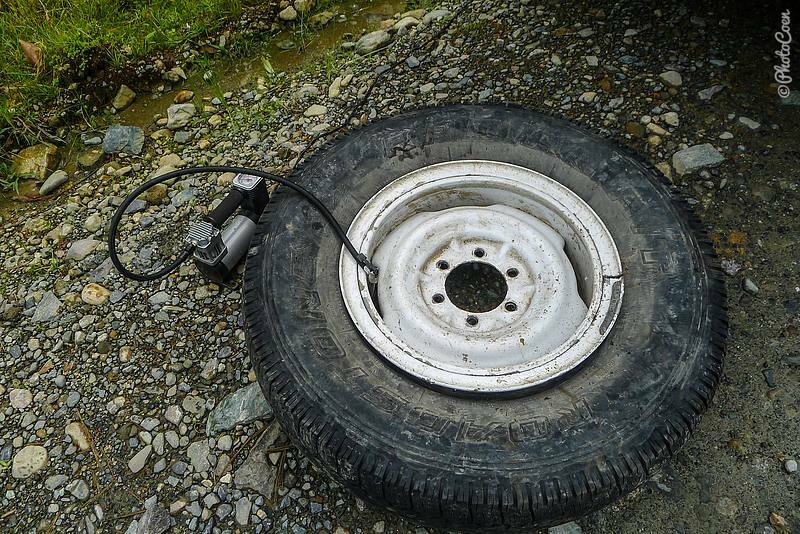 By the time he was inflating the tire with our air compressor, which works fine but takes a lot of time, a truck driver stopped and asked whether he could be of help with his (find them here ). 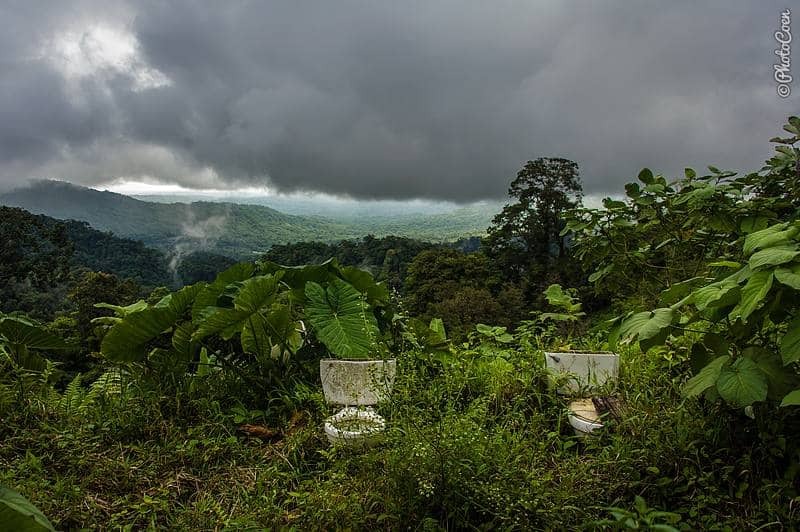 And all this in the dangerous, FARC infested region of the Chocó. This is the other side of the coin: not everybody is bad. We remain convinced that only few people are evil and that the majority of people are nice, friendly, kind, willing to help and want peace in their lives. Not all FARC members are evil either, for that matter. Before our flat tires we had passed a group of what initially looked regular soldiers. 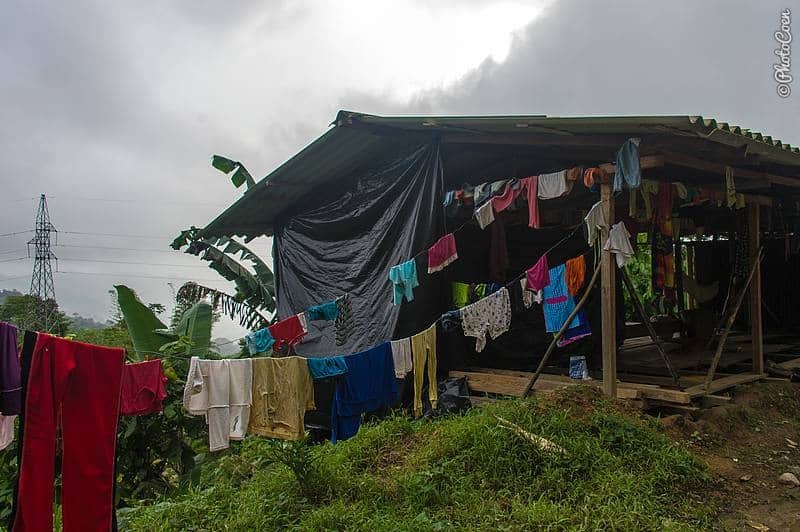 But they wore rubber boots – which is typical of the FARC – and not combat shoes, which ‘official’ soldiers do. They hadn’t stopped us, hadn’t harassed us, hadn’t asked us for money. A bit of color in the green surroundings. Within two hours Coen had changed an inner tube and put the fixed tire on the right-back side. We were back on the road with a total confidence now about being here and doing this. In La Quinta we ate a plate of rice and beans with a fried egg and patacones. Coen could take a shower as well. With regained energy we continued westbound. The road stopped being a road and turned rather into a crude track through the forest. With the sun filtering through the foliage and bird twitters it was quite idyllic to drive here despite the bouncing up and down. A remarkable thing happened: truck drivers and bus drivers became the friendliest we have ever met on the road. Everybody was willing to let us, and each other, overtake, taking the trouble to slow down or to move to the side as much as possible. No machismo here of wanting to stay ahead of the one who’d like to overtake. 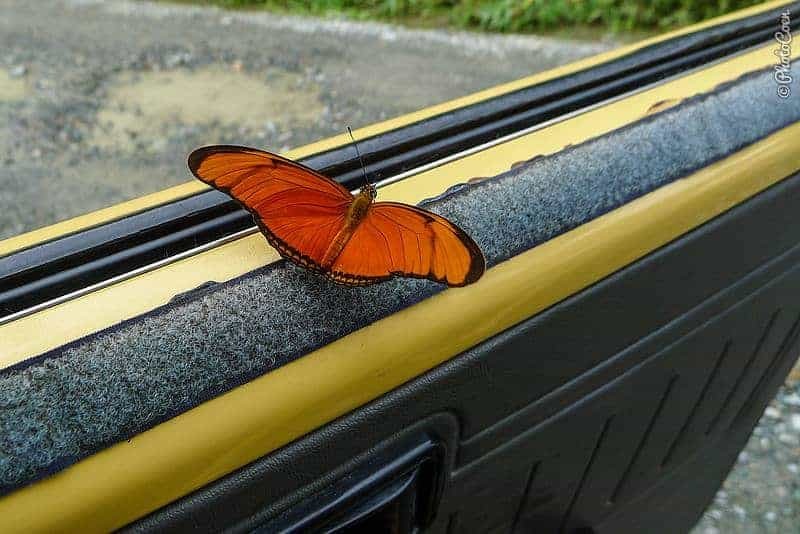 This was an absolute novelty in all of South America! I had hoped for good, dry and warm, weather, after a cold five days in the mountains around Medellín. 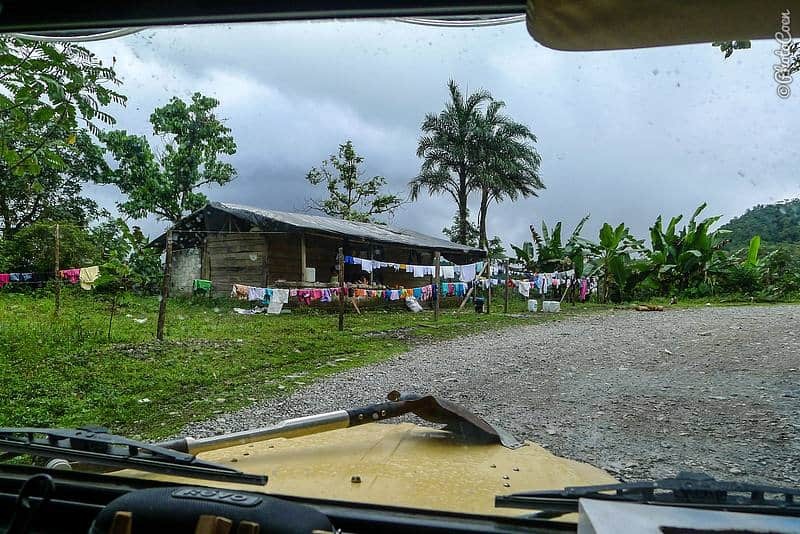 I now read in a guidebook that the Chocó, in fact, is one of the wettest places in the world! Brilliant. And so it was unsurprising that after an hour of sun, it was replaced by black clouds and a second downpour. Suddenly the looks of people started to change. We passed indigenous huts along the side of the road, the inhabitants typically with incredibly straight and black hair. 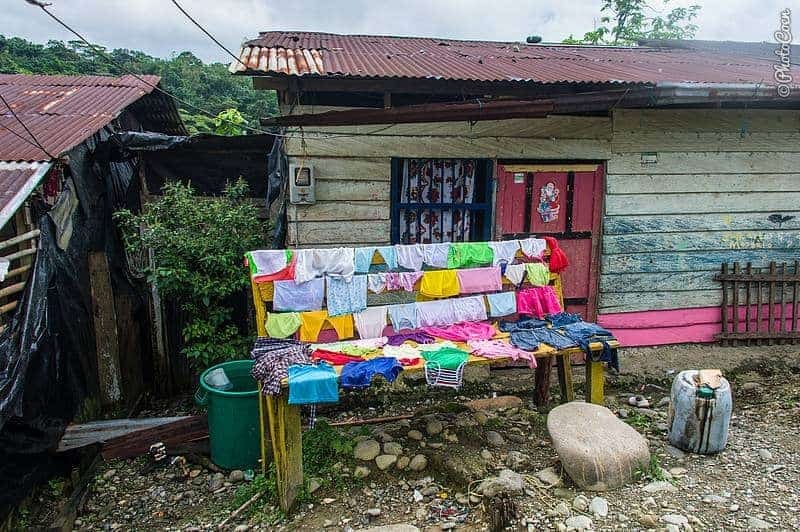 Laundry was lying and hanging all over the place: on roofs, on the road, on barbed wire. The people carried their wares like indigenous people in Laos do: in baskets on their back held in place with a strap running across their foreheads. From indigenous terrain we enter Colombia’s Africa. In Tutunendo it felt as if we were back in Suriname, or imagined this could have been anywhere in black Africa. I’d say that ninety percent was from African descent. Wooden huts were all over the place, music blared from everywhere simultaneously, local people hang about, others raced around on motorcycles or lingered in front of their houses. A sense of gaiety enveloped the town. It was unfortunate that dusk was falling. This wasn’t the time to check it out as much as we wanted to, and it didn’t feel exactly right to spend the night here (if for no other reason than the noise; it was weekend). It might very well have been. Had we arrived here around noon, eaten here, walked around a bit, and gotten to know people why might have had a great experience here. We regret not having spent more time here. After having fixed the tire, the owner invited us for a tinto (coffee) down the road before we started a 2nd tough day of driving. At the bridge leaving the town we were stopped by a couple on a motorcycle who were curious about us and wanted to chat. We would meet them later in Quibdó, two more times, and during the second time they handed a sombrero to Coen as a gift. More signs that confirm our belief that also in the Chocó there are lots of friendly, well-willing people. It was a long day of driving, exiting as well as exhausting. We were glad to reach Quibdó where several people helped us find a safe place to park. It was time for an early night. 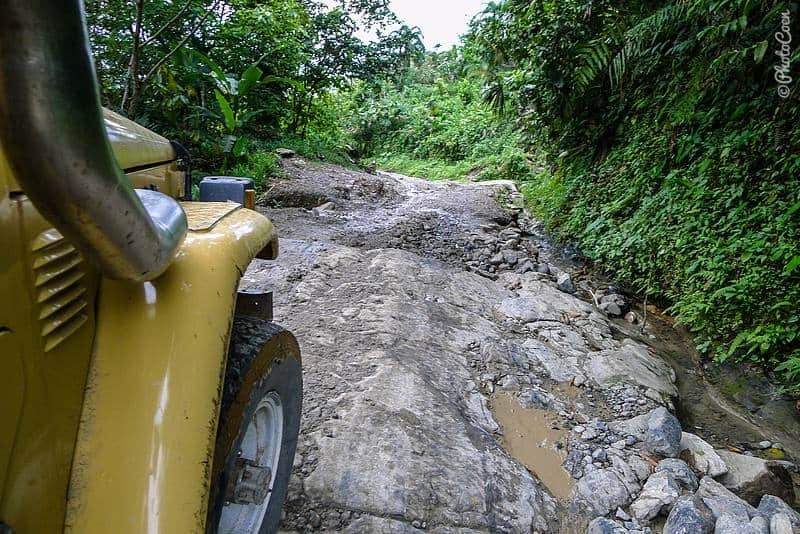 (Information for other overlanders: you can continue the loop by driving from Quibdó to Pereira, a road which is partly unpaved and potholed but also in the process of being asphalted). Interesting, remind us of Ethiopia.